Cairo, Georgia, also known as Syrup City, is a moderately populated area situated within Grady County. Known for its distinctly hospitable townsfolk and atmosphere, it is an ideal place to call home. Delivering plenty of small-town and southern charm, you will instantly be drawn to all of the local events that are put on by the city and attended by many in the community. With just under 10,000 residents, this city is the perfect size for getting to know your neighbors and getting involved in the community without feeling as if you need to look elsewhere for a bit of variety. With plenty of resources and attractions to offer, Cairo, Georgia achieves an enviable balance that the majority of people are looking for when searching for a city in which to live. In addition to its traditional southern feel, the city also has an ever-expanding industrial base, consisting of a multitude of healthcare, manufacturing, and service companies. This healthy commerce landscape allows the city to boast a strong economy, while providing a fair amount of opportunities for employment. The educational landscape is also alive and well with 3 elementary schools, 2 middle schools, and a K-8 school provided for those living in more distant areas of the county. Also, for higher education, there is a branch for South West Georgia Tech, with the main campus located in nearby Thomasville. 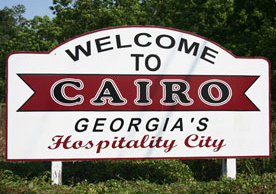 In terms of recreational opportunities, Cairo, Georgia has plenty of opportunities of which the local residents like to take advantage. These include plenty of close-by hunting and fishing in addition to points of historical interest and plenty of festivals for an authentic taste of the local flavor. These festivals and events provide a great hometown feel and include the locally revered Whigham’s Rattlesnake Roundup, Calvary’s Mule Day, and even the Antique Car Rally, which features plenty of activities for all ages. Along the lines of this local flavor, Syrup City is so named due to the fact that it was a leading producer of cane syrup for a good portion of the 20th century. This is still a great source of pride in the community and is quite evident by the fact that the local sports teams still retain nicknames alluding to their great source of agricultural history. A wholesome place to live and raise a family, Cairo, Georgia is the perfect city for just about anyone to make their home.